Halloween is over and done, which means three things. First, it means you have to take all of your Halloween decorations down. Second, it means Black Friday and the holidays are just around the corner. And third, it means retailers have tons of candy to sell off at dirt cheap prices. 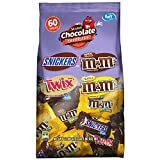 Amazon has the best post-Halloween sale we’ve seen, with MARS Chocolate Favorites Fun Size Halloween Candy Bars Variety Mix Bags on sale for just $6 each. Each bag weighs 33.9 ounces and includes 60 pieces! Get them while you can because this deal is definitely going to sell out soon.